When you meet Ernie Hinkle, a man who has lived 90 years on this earth, you find out pretty quickly that he has stories to tell. 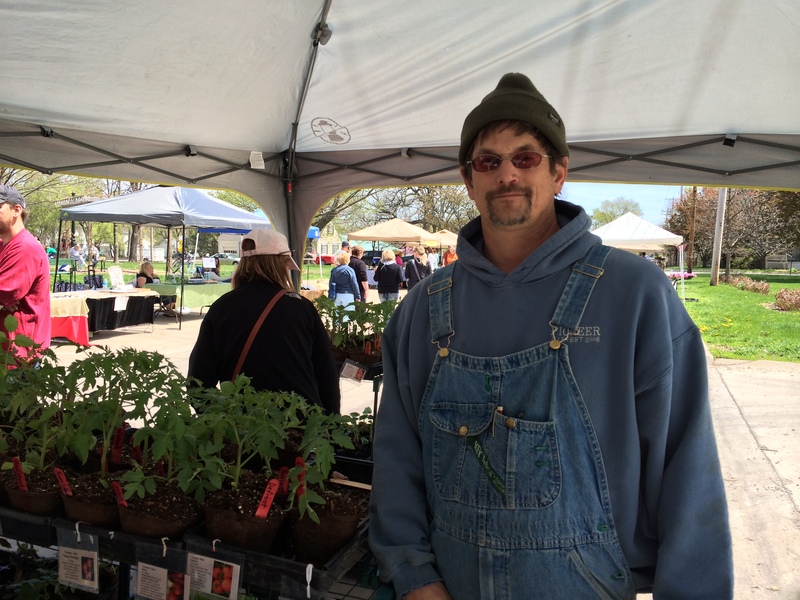 In his well-worn jeans and suspenders, plaid shirt, and Fesler Auto Mall cap, he is chatting with a teenager when I approach his table at the Fairfield Farmers Market. While his face is remarkably free of wrinkles, his hands are a sculpture in clay, swollen from arthritis and hard work, dirt embedded in the cracks of his skin. Sometime in the gap between handing him the cash and adding his persimmons and pears to my bag, Ernie starts spinning a yarn. “As a young man, I traveled the Midwest performing in showboats and vaudeville acts.” As if to prove it, he opens his mouth and belts out “Old Man River” in the middle of the market. A colorful personality known throughout the state for his performances in charity shows and fundraisers, Ernie was inducted into the Beard-Growers Hall of Fame in Eddyville for his annual green St. Patrick’s day beard and his red, white, and blue sesquicentennial beard. Not to mention 56 years of playing Santa in Sunday schools in Birmingham and Fairfield. As a salesman for Iowa Tire in Fairfield, Ernie made many friends while driving his long route throughout southeast Iowa and northern Missouri, often raising money for families in need and more than once saving the lives of motorists who crashed on the highway. 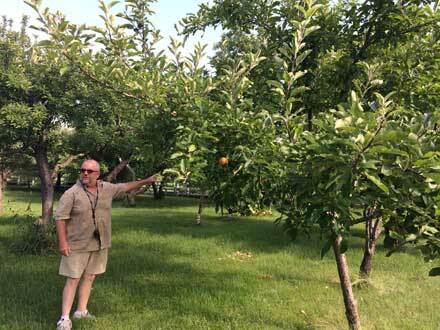 On the 10-acre truck farm where he and Betty still live, Ernie has lovingly tended over 50 varieties of fruit trees, plus a one-acre garden and some berry patches. He grows his own horseradish and until recently sold 700 pints of horseradish pickles and hundreds of gallons of home-pressed cider each year. The last time we chatted, Ernie mentioned that he and Betty were about to celebrate their 70th anniversary. And, oh yeah, he let it drop that over the years he and Betty took in 30 foster children—yes, that’s 30—and adopted six of them. I want to know more about this side of Ernie Hinkle, but when I return to the market the following week, he’s gone. Soon I’m on the phone with Dennis Ives, a nephew of Ernie and Betty’s. Dennis tells me that, sadly, Ernie has taken a bad fall while picking plums. He will take a while to heal from his injuries, and will need assistance that can only be given in a nursing home. 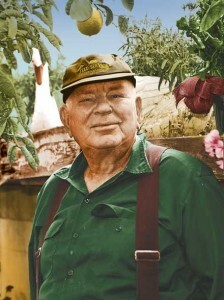 Dennis invites me to the family farm, where he and his wife are staying to help Ernie and Betty in this time of need. Other children have flown in as well, including the youngest child, April, and her husband, Dylan, who teach theater arts in Wales. It’s easy to find Ernie and Betty’s Victorian farmhouse in Birmingham, surrounded by orchards, flower gardens, and a grape arbor. In a way it’s fitting, to be sitting with Betty and Dennis in the Hinkle kitchen with its bright yellow counters, hearing stories about this man who was the best storyteller of all. “Ernie and I used to joke that when he came home each night he never knew how many children he had,” says Betty, who at age 90, has energy and brain power to spare. “Social services would call up and say, ‘We have five boys—can you take them for one night?’ Then the ‘overnight’ lasted six months.” Those boys ranged in age from two to fifteen. 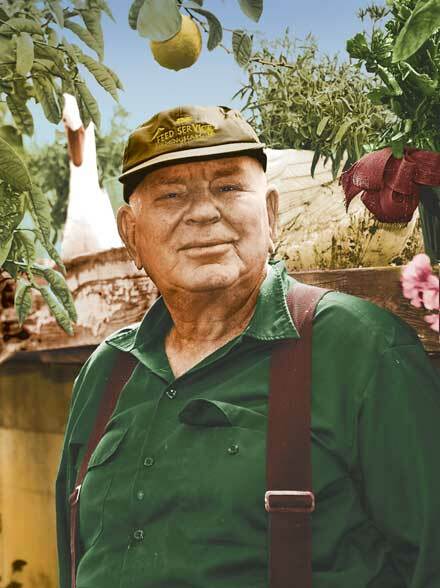 Dennis helped Ernie run the farm, rising at 4:30 a.m. to feed the animals before school. Tuesdays were candy nights, when Ernie would walk into the parlor and toss each child a candy bar. “We were eagerly waiting,” Dennis remembers. Dennis was a smart kid, and Ernie and Betty sent him to College of the Ozarks in Branson, MO. “I was working with Ernie in the tire business, which helped him a great deal, but it was Ernie who told me, ‘You need to get your education.’ ” With Ernie and Betty’s support, Dennis went on to medical school. Today he manages hospitals in Arkansas. “I owe my whole life to Ernie and Betty,” Dennis says. He means this literally. When Dennis came to the Hinkles, he had nephritis, a deadly kidney disease in the era before dialysis, and he wasn’t expected to live more than a year. Ernie rearranged his tire route so he could drive Dennis to the University of Iowa Hospital once a week for treatment. With the healthy food and lifestyle on the farm and an innovative medical treatment, Dennis eventually was cured by age 14. “Ernie and Betty are two of the most generous people that I know,” says Dennis. “They’ve always been there for anyone who needs anything. . .” Dennis stops, overcome with emotion. Betty picks up the story. She tells about Leslie, a baby with Down syndrome they adopted and raised. The cover of Ernie’s book lists his many roles: actor, auctioneer, beekeeper, emcee, gourmet, herdsman, journalist, lay preacher, politician, poet, horticulturalist, entertainer, musician, orchardist, truck driver, writer, loafer, water-witcher, Sunday-school teacher, salesman, and Santa. And that’s just half the list. Yet Ernie’s true legacy is the children he and Betty raised and the people he helped throughout his life. When I drive away from Ernie and Betty’s orchards, my last glimpse is the sign “Leslie’s Little Bit of Heaven” in the rearview mirror. I remember something Ernie said last month at the farmers market that sums up his philosophy of life. Due to Ernie’s recent injuries, the Hinkle family sold the family farm in Birmingham. Eating local foods in season is all the buzz these days, the smart way to support the environment and the local economy. Yet according to ayurveda, the traditional health care system of ancient India, eating seasonal foods is also the best way to prevent disease. As every Iowan knows, each season brings a dramatic change in temperature and humidity. In ayurveda there are only three seasons: the cold and dry fall/ winter (Vata season), the cool and wet spring (Kapha season), and the hot summer (Pitta season). “As any particular season wears on, imbalances start building in your body, and if these imbalances are not addressed, they can get more rooted in the physiology and become a chronic condition,” says Dr. Sankari Wegman, an ayurvedic expert at The Raj Maharishi Ayurveda Health Center, a world-class spa in Maharishi Vedic City that serves organic, locally-grown vegetables, fruits and herbs from the city’s farm and greenhouses for its clients’s meals, and to the public for Sunday brunch. According to ayurveda, by the end of summer, your body becomes, well, hotter. It’s more susceptible to heat rash, skin breakouts, and fatigue. And because the mind, body and emotions are connected, the mounting heat can be expressed as irritability and anger. More serious health problems resulting from too much heat in the body include ulcers, eczema and heartburn. The ayurvedic solution is simple: use your food as medicine. Ayurvedic cooking is based on six tastes: sweet, sour, salty, bitter, astringent and pungent. Sweet: milk, butter, ghee (clarified butter), rice, wheat, and small amounts of raw sugar. Sour: yogurt, lemon, aged cheeses and pickled foods using vinegar. Bitter: leafy greens, basil, lettuce, nettle, bitter melon (available in Asian markets), Japanese eggplant, turmeric, fenugreek seeds, barley, jicama and aloe vera. Astringent: lentils and other pulses, beans, tofu, quinoa, sprouts, apple, pear and pomegranate. While every ayurvedic meal includes the six tastes, the idea is to use them in different proportions depending on your individual body type and season. In the hot summer season, for example, the ayurvedic cook includes more sweet, bitter and astringent tastes, as these are more cooling. Dr. Wegman also recommends seasoning your foods with mild spices and herbs during summer. “Many people find that their digestion is slower when the weather is hot, so it’s wise to eat lighter,” she says. “You can give your digestion a boost with cooling spices, such as cardamom, coriander, fennel, dill, turmeric, mint, basil, and cilantro. Fortunately, the cooling ayurvedic foods—basil, cucumbers, summer squashes and broccoli—are the exact foods you’ll find in your own garden and farmer’s market during summer. So buy fresh, buy local, and buy what’s in season—and you’ve taken the first step to a healthy ayurvedic diet. Fruits. Organic grapes, cherries, sweet berries, melons, plums. Vegetables: Organic asparagus, cucumbers, green leafy vegetables, broccoli, fennel, celery, okra, green beans and summer squashes like zucchini. Herbs: Cilantro, mint, basil, dill. Bring water to boil and add beans. Cover and reduce heat. Cook 10 minutes. Stir occasionally. 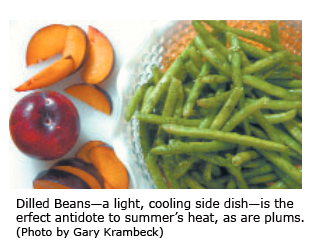 Drain beans and plunge into cold water, strain again and set aside. Heat ghee in a wok or frying pan, add aesofetida and cook 30 seconds. Add beans and stir occasionally until thoroughly heated. Add the dill, salt and pepper. Toss well and serve. 6 1/2 cups cold water. Fennel bulb served with leeks makes a sweet-tasting soup, while the watercress adds a lively flourish. Fennel is so flavorful that ther’s no need to make a stock. In fact, using water for the liquid allows the full taste of the vegetables to come forward completely unmasked. Serve this soup with just a swirl of watercress purée or enrich with with a spoonful of ghee (clarified butter). A handful of little croutons, sauteed in butter, always adds a nice cruncy touch to puréed soups. Wash and slice all the vegetables first. If the inner core of the fennel is tough and stringy, remove it with a paring knife, but usually even a well-developed core will be tender. The following recipe is good for pacifying Pitta dosha and makes 1 1/2 cups. Dry roast the ginger root, spices and fennel seeds. Add plums, salt, juice, sugar and grated orange peel. Raise the heat slightly, and stirring constantly, bring to a boil. Reduce the heat and cook the chutney about 1/2 hour. In ayurveda there are only three seasons: the cold and dry fall/ winter (Vata season), the cool and wet spring (Kapha season), and summer (Pitta season), which can be scorching hot. For more information on ayurvedic cooking, visit http://www.theraj.com/ or www.mapi.com. One of the simple pleasures of a living in a small town is riding a bike everywhere you go. My husband and I love to pedal downtown to Howard Park every Saturday morning for our local Farmers Market. 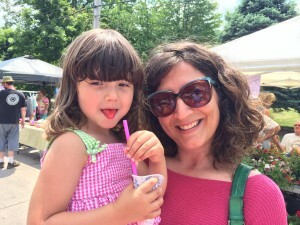 We’ve frequented much bigger Farmers Markets in Florida and the Bay Area, but there is nothing like the friendly and eclectic mix in Fairfield. There you can chat with Fairfield’s Amish and Mennonite neighbors who sell pasture-raised organic eggs (Robert Yoder Farms from Bloomfield), the healthiest flower baskets you’ve ever seen (Lengachers Greenhouse in Keosaqua), and freshly made pies and bread from a Brighton family. Smiling Amish teenagers help sell the produce, and shy younger children hide behind their mothers or chase each other in tag games under the trees, their bonnet strings and long dresses flying in the breeze. And then there are our amazing certified organic farmers, like Steve and Susan McLaskey, who run the new MUM Student Organic Farm. Steve is from my hometown of Naperville, IL, and is a descendent of the Goodrich family, who more than a century ago donated their farmland for Goodrich School, where I attended elementary school.The talented Dale Goodale is wandering around the market, having already sold out of the spring greens and sweet organic carrots he started in February inside his greenhouse. In early May you could buy his spectacular hand-tapped maple syrup if you got to the market early enough. I never miss a chance to talk with older, local farmers, such as Ernie Hinkle, who at age 90 still shows up every Saturday morning. He was one of the founders of the Fairfield Farmer’s market. Even though he’s not certified organic, Ernie hasn’t used pesticides or chemicals on his garden veggies for decades. The former mayor of Birmingham, IA, Ernie and his wife raised over 30 foster children and adopted six. 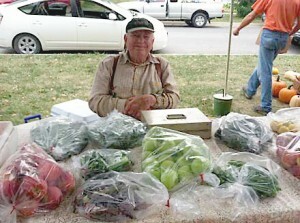 Last week I bought a bag of spring lettuce greens from Ernie and was treated to a story about his time in vaudeville. He’ll regale you with a song if you ask him. I also bought organic pasture-raised eggs from Steve and Kim Keller, whose father was a friend of Ernie’s and also a founder of Fairfield’s Farmer’s market. They carry on their father’s farming tradition and are certified organic. (The eggs, by the way cost only $3.50. In the Bay Area organic, pasture-raised eggs were 8.50 a dozen!). 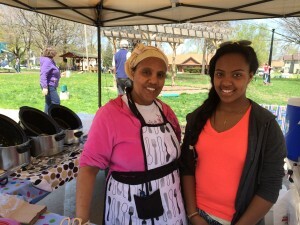 The Farmers Market is also a great place to meet friends, who gather for the food, music and fun. Eventually we settle down at a crowded picnic table and eat a hot lunch of the best Ethiopian food in the Midwest from our friend Gannet and her daughter Hermella. The lentil samosas are a treat I look forward to all week. One of my favorite vendors in spring is Rolling Prairie Acres, run by the Webster family of Sigourney, Iowa. They start garden veggies in their greenhouse for the rest of us to plant in our gardens in spring. Every year I buy three kinds of tulasi (holy basil plant), tomatoes plants and zuchinni starters. All their plants are grown pesticide free, chemical free. Last year when the sow bugs mowed down my squash plants overnight, I asked Doug Webster for a bug-resistant squash. He recommended a bottle guord called Cucuzza, whose stinky leaves and thicker skin repelled bugs. Its vines wrapped around our garden and grew over 200 lbs of long pale green squashes that tasted a bit like zuchinni without seeds. My Indian friends thought they tasted just like lauki, bottle gourd, and cooked them into fantastic Indian dishes. My gardening partner Charlotte Judge dubbed this prolific plant the Cure for World Hunger. I bought six starters from Doug Webster this year, to share with our friends. It’s encouraging to see kids getting into the spirit of growing and selling produce along with their parents and grandparents. At Rolling Prairies, Doug’s son Dawson taught me how to plant a seedling in a peat pot. And Paloma and Marisol Braun, aged 13 and 10, run their own business selling snow cones at the Farmer Market. Marisol told me how she markets their tasty drinks: “I whisper to one of my friends that the stand is open and they whisper it to their friend and pretty soon there’s a whole line of kids at our stand.” Talk about word-of-mouth marketing savvy! One Saturday in early May I drove my car to the market so I could buy flats of seedlings, and ended up with too much to carry away from the Lengacher’s booth, where the Amish parents had left the selling to a teenage daughter Lydia and her older brother. Seeing my two flats, Lydia politely asked, “Would you like help?” I declined, not wanting to distract them from their job selling. I grabbed one of the flats and started to my car, only to hear bare feet padding behind me. It was Richard, the six-year-old younger brother of Lydia. He smiled shyly under his straw hat and I could see the gap in his teeth where a new tooth was growing in. He never said a word, but he carried my second flat to my car, happy to be helping and grinning all the way. The first time I drove through the Italian heartland, I thought I’d entered heaven. Romantic medieval villages, rolling hills sculpted with vineyards and olive groves, and, of course, the food. Whether we ate in a family-owned trattoria, shopped in colorful outdoor markets, or frequented tiny frutta e vedura (fruit and vegetable shops), locally grown produce was everywhere. And it tasted amazing—the mineral-rich Italian soil yielded raspberries the size of your thumb and zucchini tasting like manna. I remember solemnly telling my husband and friends, “You know, we could have this in Iowa.” They eyed me warily, wondering if my brain had fried in the Tuscan sun. But I didn’t mean the castles or winding roads or Renaissance art. I meant the food. Because even on that first brief visit, I glimpsed how the small family farm was the living heart of Italy’s vibrant rural culture. In his book A Cook’s Journey: Slow Food in the Heartland, Chef Kurt Michael Friese takes us on a culinary journey as delectable as any Italian countryside’s—except this particular feast for the senses is happening right here in the heartland of America. As a national board member of Slow Food USA and co-owner of the celebrated Devotay restaurant in Iowa City, Chef Friese knows good food when he sees it. Over the course of four years, he traveled to 13 heartland states in search of people who champion Slow Food. The book is a collection of his informal essays about the various farmers, chefs, food artisans, and organizations that he encountered. The Slow Food movement started (you guessed it) in Italy, when folks protested the first MacDonald’s opening at the foot of Rome’s Spanish Steps. Unlike its name, since its beginning in 1986 Slow Food spread quickly—around the world and most enthusiastically in America, mainly along the coasts. 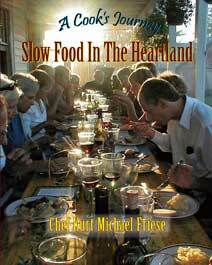 In 1999 Friese founded the first Slow Food convivium in Iowa (today one of five). He wrote this book partly to show that Slow Food is not a coastal phenomenon—in fact, he points out, many of the world’s most cherished food traditions are from the rural centers (think Tuscany or Provence or Sichuan). The essays are as easy to read as a chat over the back fence, seasoned with deft character sketches and sprinkled with recipes tested and tweaked by Chef Friese (making the recipes alone worth the price of the book). Infused with the consummate chef’s love for good food and good living, Friese dishes his philosophy with a spoonful of brie, so to speak, skillfully weaving the tenets of Slow Food with sensual descriptions of heat coming off a just-picked heirloom tomato or the nutty flavor of Walloon, a raw-milk goat cheese from Missouri. 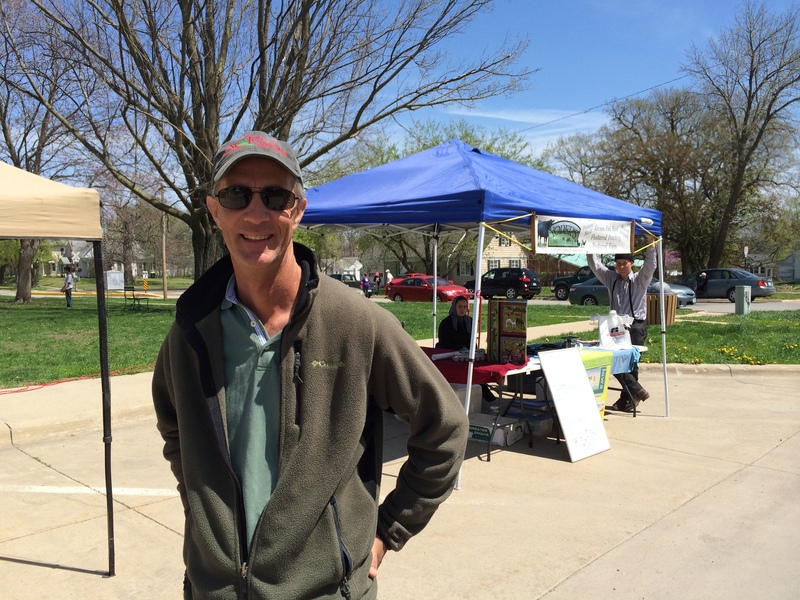 While there are many eye-openers in the book, the description of Seed Saver’s Exchange in Decorah, Iowa, one of the world’s largest guardians of heirloom seed diversity, hit close to home. It was sobering to read that today only 30 plant varieties feed 95 percent of the world’s population. By collecting some 24,000 heirloom seeds from around the world and making them available to its 8,000 members around the world, Seed Savers is possibly the most biodiverse place on the planet. The orchard alone, which is open to the public, contains 700 varieties of 18th century apples. This sounds like a lot, until you read in the next sentence that in 1899 there were 8,000 apple varieties recorded. One thing I like about foodies—they don’t dwell too long on problems. 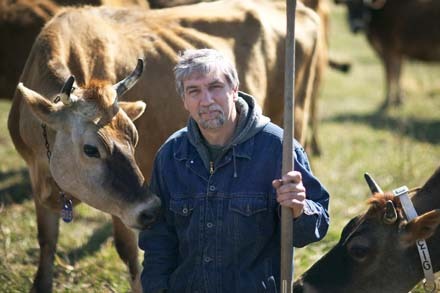 Although Friese touches on the bureaucratic snafus some of the organic growers have encountered, referring humorously to the “Law of Unintended Consequences,” he mainly points to the ways our heartland foodscape is rapidly changing for the better. Friese is eclectic, featuring deer, buffalo, and mulefoot hog ranches alongside the Dragonfly Neo-V—Columbus Ohio’s world-class vegan restaurant. He is also inclusive, explaining that although not everyone featured in his book is an official member of the Slow Food movement, they are still important contributors. “So many are and don’t know it,” Friese muses. As readers, we can become part of the Slow Food movement, too, he reassures us, just by planting a garden, shopping at a farmers’ market, or visiting a farm. Reading this book is like sitting down to a home-cooked feast with new friends and old—the best kind of food for the soul. Imagine a small town where homes are powered by the city’s own wind farm, and energy consumption city-wide has dropped by 60%. Accessible pathways lace the town, making it easy for people to bike or walk to work. One-fourth of the produce offered in the town’s supermarkets is locally grown, raised on thriving farms that surround the town. Tourists boost city revenues by flocking to the fully functioning sustainable living center. Needless to say, the economy of this small town is booming, stimulated by tax cuts and energy savings, with ample jobs created from innovative, eco-friendly enterprises. This is the sort of future the town of Fairfield, population 9,650, envisions for itself. And to ensure that this happens, the town fathers have recently ratified the Fairfield Green Strategic Plan—a coordinated effort to become a sustainable, green community within ten years. It all started with an idea that Mayor Ed Malloy had been turning over in his mind for a couple of years, to develop an integrated plan to move Fairfield toward a green future. A few short months later, in November 2008, the city council unanimously ratified the 28-page green strategic plan. At the same time, the planners garnered tremendous support from the Iowa Power Commission, which awarded the city of Fairfield a $80,000 grant to assess current energy efficiency and create detailed strategies for moving forward. The plan’s wide range of objectives include reducing non-renewable energy consumption and increasing energy generation; conserving water, protecting the air, and transforming wastes into useful resources; designing buildings and landscapes for efficiency and human well-being; and supporting a prosperous and sustainable local farm economy. “Now that the Fairfield Green Strategic Plan has been approved by the city council, the commission has moved to the next step and are meeting with various community leaders to ask them to take responsibility for different sections of the plan,” says Malloy. For example, one goal is to create an organization to develop local food production and processing. The community organizations that are being asked to take responsibility for that part of the plan are Hometown Harvest, Pathfinders Resource Conservation and Development, and, as secondary leaders, the Fairfield Entrepreneurs Association and Maharishi University of Management. The real genius of the plan is the way it involves every member of the community, from school children to housewives to factory workers. One of the first steps is to galvanize the citizens of Fairfield to reduce their own energy usage—whether that means wrapping their hot-water pipes with insulation or installing solar panels or riding bikes to work. This will be done through creating and distributing a household guide, and through an educational campaign using all available media, says Mayor Malloy. Another important step is to hire a community sustainability coordinator by March 2009, who will coordinate the efforts of various community sectors and keep the plan moving forward. As possibly the first small community in the nation to adopt a comprehensive green plan, Fairfield is planning to take a leadership role. One of the major objectives of its strategic plan is to help other communities go green. “We want to create a model community, a virtual template that other small towns can adopt to create the same results,” says Mayor Malloy. He points out that Fairfield already has many of the resources to move forward. Fairfield is the home of Maharishi University of Management, for instance, which offers the first Sustainable Living major in the country. The students and faculty there have spearheaded the construction of a revolutionary 7000-square-foot Sustainable Living Center and classroom building on campus, using wind-and-solar power, earth block construction, rainwater catchment systems, and geothermal heating and cooling systems, now under construction. University farms already grow organic food in gardens and greenhouses, supplying the university cafeteria and nearby groceries with local food year-round. “Many of the sustainable living department’s faculty and graduates have donated their consulting services to help the commission create Fairfield’s Green Strategic Plan, and we’re hoping they will continue to lend their expertise to various projects over the years,” says Malloy. Malloy points to the city’s strong entrepreneurial sector, which he predicts will rise to the occasion and provide many of the services that will be needed to turn the town green. Fairfield also has many existing demonstration projects, which serve as models for sustainable living. Malloy cites Abundance Ecovillage, a Fairfield development with off-the-grid homes powered by wind and solar, rain catchment and retaining ponds, and recycled sewage. Downtown, KRUU 100.1 FM, Fairfield’s local radio station, has installed solar panels to run its services completely off the grid. One of the grander aspects of the plan is to build a sustainability center on the south edge of Abundance Ecovillage. The center will include classrooms, workshop space and dormitory rooms for hosting educational seminars and courses. 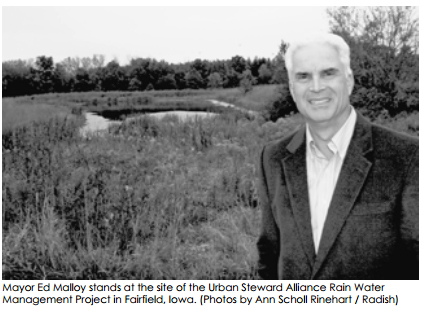 In this way, the city hopes to become a nationally known center for sustainability. Already, notes Boyer, the city has been accepted in an incentive program offered by Alliant Energy to switch to LED traffic lights, which are brighter, use less energy, and last years longer than the current incandescent bulbs. The estimated savings in energy usage and personnel: $18,000 a year. On a personal note, Boyer and her husband have asked a group of sustainable living students from the university to assess their historic bed-and-breakfast to recommend ways to make it more energy efficient. It is individual actions like this, multiplied many times, that will make the plan a success. Dirt. Mud. Clay. Cob. Cob building is an ancient way to build with earth, used most famously in England to create picturesque cottages with thatched roofs. There are many advantages to cob building—it can be warm in winter and cool in summer, it’s natural, nontoxic and beautiful, and it costs very little. Lin Mullenneaux works on the cob house in progress. For more photos and updates, see http://hapnlin.com/the-cob-house/. Just ask Hap and Lin Mullenneaux, a Fairfield couple in their 50’s who recently sculpted their own cob home with the help of friends and family. The total cost for their modest 14×18’ two-storey cottage? Just $7000. And half of that was for the green metal roof and sturdy Pella windows. 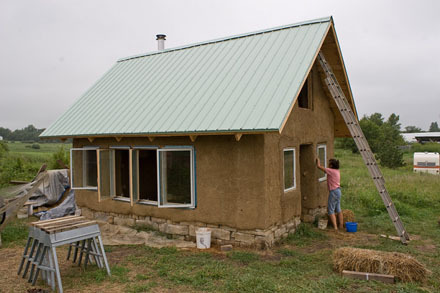 It all started in the summer of 2007, when the Mullenneauxs attended a workshop at Cob Cottage Company in Oregon with Ianto Evans and Linda Smiley, who have promoted cob building around the globe through workshops and their book, The Hand-Sculpted House. After their trip to Oregon, Hap and Lin traveled to England, where they met the young British cob builders, Adam Weismann and Katy Bryce. Adam, who grew up in Iowa City, met Katy while studying documentary filmmaking in London. They also learned cob building in Oregon and have gone on to win awards for their work in England. Back home in Iowa last fall, Hap and Lin purchased a $700 camper on eBay, parked it on their land near Fairfield’s Abundance Eco Village, and moved in. They planted trees, built a hoop greenhouse that serves as an open-air garden in summer, constructed the three-sided rustic wood shed that serves as their outdoor kitchen, shower and workshop. When spring came they started constructing the cob cottage, with the help of over 50 volunteers. I was one of those volunteers, helping Lin mix the cob on tarps, using buckets of clay substrata dug from their own land, buckets of sand, water and straw. We mashed it with our feet, formed it into lumps with our hands, and tossed it fire-bucket-brigade style to Hap, who slapped it on the wall to meld with other cobs into a solid earthen mass. A few months later, on a cold November day, I visit Hap and Lin in their completed cottage. They’ve covered the cob walls with a water-resistant render made of cow dung, earth, and straw and white-washed that with lime. It’s a fairytale place, with a limestone foundation, a green metal roof to catch rainwater, and a periwinkle blue door. It sits comfortably on the land, like it grew there. Winds are gusting up to 35 mph, but the 18” earthen walls keep the cottage snug and warm, even without the wood stove going, their only source of heat. It’s the first time I’ve seen the finished interior, and I feel like I’m being hugged by nature. Plaster walls—made by Lin from a mixture of kaolin clay, sand, straw, wheat paste and cattail fiber—are smooth and curvy, like sculpted stone. Sturdy benches carved out of cob, beams of round pine logs that Hap cleared as deadwood from the local forest, and a winding slate staircase to the sleeping loft add rustic charm. Coat hooks are made of tree branches. Hap has built a kitchen counter out of old planks, stained golden with the dark brown grain making an intricate pattern. A friend gave him some walnut boards that had been sitting outside for seven years and Hap made them into shelves that hold Mason jars of beans and grains. Cast iron pans and bunches of dried garlic and fennel from Lin’s garden hang from the rafters. Lin offers me a seat on one of the sculpted cob benches, shaped like a couch and covered with sheepskins. Hap sits in his rocking chair next to the built-in walnut book shelves and computer shelf. A wire to power the computer is the only electricity in the home, and eventually that will be powered by solar panels. “Do you want to see the cowboy bathtub we’re looking for?” he asks. It’s a small galvanized tin tub with curved sides like an upside down cowboy hat. It will fit in the sleeping loft, and an Amish pump will supply water — heated on their wood stove — through a copper pipe. “This is an experiment in sustainability,” says Hap. Hap and Lin hope to inspire and teach others to build their own homes with natural materials. Hap is the treasurer of the Sustainable Living Coalition, which is creating a campus adjacent to the Mullenneaux homestead and Abundance Eco Village. It will include a center for sustainable living and courses on permaculture and natural building. Already, some of the volunteers on the Mullenneaux house are starting their own cob building projects in Fairfield. Hap notes that their home’s interior, with its rounded niches and undulating walls, is a result of the flowing nature of cob building. “It’s a comforting space,” says Lin, who feels that what’s missing in modern architecture is the curved line—the feminine element, the comfort of the mother. “When you use uniform materials, straight boards and sheet rock, the result is something straight and rigid,” says Hap. “With cob building, it’s easier to be round than straight, and you naturally create more curved, gentle shapes. Every cob home is unique. You’re never going to feel that oppressive uniformity in a cob home”. Hap has also thought a lot about the difference between natural building and green building. Hap and Lin say they had two goals when they started: to build a sustainable home that allowed them to spend most of their time outdoors, and to avoid going to the bank for a mortgage. And they were able to achieve both. To see Hap and Lin’s Cob House Journal, go to www.pbase.com/hapm/ourhouse. Farming is also a way to keep the family together. When the father works at home, he can take an active role in raising the children, training them in the Amish way of life. The Amish believe that farmers live closest to God. “On a farm, you can see that God is in all things that are alive and growing,” explains Leah Peachy, an Amish woman I met in North Carolina. They are also known to be excellent farmers. Centuries ago, while still in Europe, the Amish were often banned from land ownership and were forced to farm land so poor that no one else wanted it. In order to survive, they experimented with new methods, such as crop rotation. The Old Order Amish today still practice a four-year crop rotation system in Iowa and other states, planting corn for two years, oats for one year, and a hay crop the fourth year. The Amish feel that they are not the owners of their land. Rather, they are caretakers, entrusted with the use of the soil. they carefully nourish their fields — preferring organic fertilizers such as manure — so that when they retire, the land is as healthy as when they began. If any Amish man damages the soil, he is considered to b3 as sinful as a thief. As a result, Amish farms are extremely fertile and productive. Golden sunlight stretches wide over the Iowa hayfields in early September. At the Yoder farm near Bloomfield, a girl waves a hearty hello. This is Regina, age 15. Besides household chores, she and her older sister Annie milk their family’s cows and drive a team of horses in the fields. me,” says Annie with a laugh. Today they wear identical raspberry-colored dresses, white aprons, and royal blue scarves tied under their chins. Both say they’d rather spend their day in the fields than inside the house. “I think it’s great fun to work out,” says Regina. Their day starts at 6 a.m., when their father wakes up the eight children who still live at home. Before breakfast, the girls feed the cows while their father and 22-year-old brother, Dan, feed the horses. All four help with the milking, then Dan goes off to work as a carpenter. The 12 black-and-white spotted Holsteins all look identical to me, but the girls befriended Jody, Joline, Vera, Abby, Shirley, Tina, Sheila, Fannie, and Pam when they were calves and call each one by name. Honey Lou and Sunny Sue, two fawn-colored Jerseys munching on hay in the corner, complete their herd. Do the cows ever kick? “Some people’s cows do kick, but ours don’t,” says Regina. “If they start to kick, we give them a little slap and they learn they can’t do that.” Hobbles — clamps that gently draw the cow’s hind legs together just above the knee — keep the cows quiet during milking. Sometimes the girls do get stepped on, which is not too serious. “It hurts for about five minutes, and that’s all there is to it,” says Regina. Suddenly three wide-eyed children appear. Robert, David and Grace, aged seven, 10 and 12, just drove home from their one-room school in an open pony cart. They show me how to hitch it up. Like a well-trained team, Robert and David pull the cart out of the shed while Grace slips the bridle on Midnight, their pony, and backs her in between the cart’s shafts. In one minute, thanks to team – work, it’s ready to go. Annie takes me for a ride. The wind blows in our faces. Annie likes riding in a cart better than a buggy, she says, “because it’s more open, more free.” We pass the grassy pasture where the Yoders’ cows and horses graze peacefully. With just a slight tug, Midnight turns around. Back on the farm, I notice the family’s three black, covered buggies stored in an open shed. Annie and Regina have driven their family’s covered buggies to town or to visit friends “since we were big enough to read up and put the bridle on the horse,” says Annie. The family owns two Standard Bred geldings to pull the buggies and nine big-boned Percheron mares to plow the fields. Both girls love to mow the hay fields with a team of two mares. “If you like horses, you like to do things with them,” says Annie. The sun slips low on the horizon by the time the cows are in their stalls. In a graceful motion, Annie swings the hobble chain under a cow named Sheila and fastens it just above the knees, drawing them together. “Usually, you milk cows on the right side,” Annie says. But since Sheila is a two-bucket cow, the girls place their stools on opposite sides of Sheila, clutch shiny metal pails between their legs, and pull the cow’s teats with both hands in brisk rhythm. Frothy milk splashes into the buckets. “Want to try?” Annie asks. I do, but when I squeeze the cow’s udder, there’s barely a trickle. Annie laughs and makes milk squirt like a faucet. 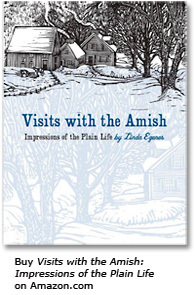 Excerpted from “Visits with the Amish: Impressions of the Plain Life,” re-released by the University of Iowa Press in 2009. Available at Amazon.com and other online bookstores. Rick Donhauser is an award-winning photographer whose work appeared in A Home for the Souland other publications. (I originally wrote this article for The Iowa Source, September 2010. Reprinted with permission. For more than 30 years Deborah Madison has championed home-cooking that is colorful, healthy and gourmet-good. 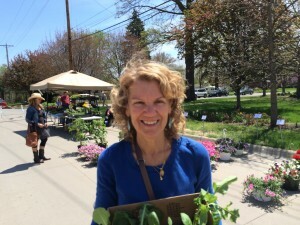 Madison, who has won the James Beard award, the Julia Child award and other awards for her cookbooks, traveled to Fairfield in May to speak at the annual EcoFair at Maharishi University of Management. It turns out that Madison has roots in Iowa—her father was born in Burlington, and she visits here yearly as a board member of Seed Saver’s Exchange in Decorah. Her book Local Flavors: Cooking and Eating from America’s Farmers’ Markets was newly released in paperback in May. 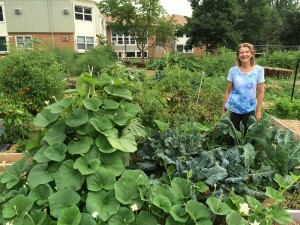 Here she talks to Radish readers about the book, farmers’ markets, and local foods. Deborah Madison: It’s important for a lot of reasons. Right now we’re seeing the costs of transporting food in our pocket books. But more importantly, the experience of going to a farmers’ market to buy local food is more satisfying and connecting. You see your friends, you see the people who live in your community, you see the people who grow your food, who might also be your friends. It’s an experience of connectedness, which I think that Americans in particular are lacking. The experience of walking down the aisle of a big supermarket with a cart is one of the saddest chores that we do, whereas going to the farmers’ market is a pleasure. Deborah Madison: Another reason is the quality of food is so much better. When you taste broccoli that’s fresh and picked the day before and it’s in season, it’s nothing like we get in the store. It’s sweet, it’s delicious. You’re gaining more flavor and with more flavor you’re getting more nutrition. And for foods that need to be picked closer to their ripeness to really taste good, like figs, apricots and tomatoes—that can happen at a farmers’ market but it can’t happen in a supermarket where shipping is involved. It’s just better food, it tastes so alive. Finally, it’s important to buy local because it’s a way of keeping money in your community, which is especially important in the rural agricultural sectors. It’s a more healthy situation for us to pay our neighbors for services instead of always seeing our money go far away to some big corporation down the road. What were your favorite Midwestern farmers’ markets you visited while you were researching Local Flavors? Deborah Madison: I actually have three that I love, each very different from each other. 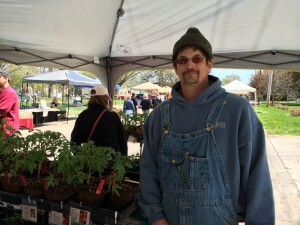 One was St. Paul’s, which is crowded, vibrant and bursting with an interesting combination of modern farmers and traditional Midwestern growers. I also enjoyed the Madison, Wisconsin, market, where a local chef and I started at 6:00 a.m., which helped avoid the crowds. I loved the feeling of the market, which is situated around the perimeter of the State Capitol, with lawns and trees. The quality of the food at both markets was amazing. The third market, in Decorah, Iowa, is the opposite of the other two. It’s tiny but I always find many interesting things to take home, foods that we don’t have in New Mexico, whether it’s ground cherries or jams made with local fruits. It’s friendly and relaxed, with interesting people. I remember a man who had ground his own corn and it was absolutely delicious to cook with, it had so much flavor and vibrancy. 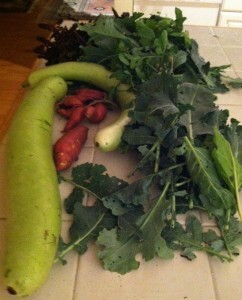 What were the most unusual locally grown fruits and vegetables that you came across in your travels across the country? Deborah Madison: In the St. Paul market I must have taken 150 pictures of amazing eggplants in purple or gold or with green stripes, even bright orange ones, grown by Hmong farmers. And there was the most amazing tropical smell—it stopped me in my tracks. It turned out to be a fragrant melon called passport. How far should we be taking the local foods movement? We can’t grow oranges in Iowa, for instance. Deborah Madison: It’s a challenging question to think about. It’s useful to think about what should be bought locally: your lettuce should be local, for instance, as wherever you are it can be grown nearby. When it’s something that can be grown where we live, I see no excuse for getting it from California. If you can get wonderful apples in Iowa, then you don’t have to buy apples from Washington and New York State. What can Iowans do to support the local foods movement? Deborah Madison: Iowans can support the local foods movement by buying foods that they know are local. 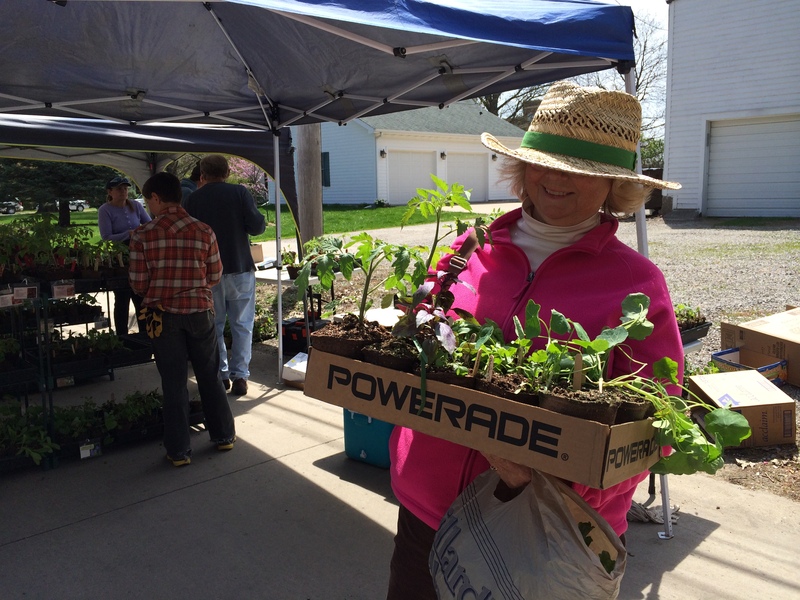 There are active Buy Fresh Buy Local chapters throughout Iowa. Certainly if you have a farmers’ market you can support local growers there. Sometimes your local co-op will feature local food. And you can always ask for local food. We have to be active consumers. We have to buy it, speak up and ask for it. If you have a chance, make this puree using the pale green or white eggplants or the violet Rosa Bianca—all of which are delicate and sweet. You can make it all in a large mortar or a food processor. Pound the garlic and pine nuts with ½ teaspoon salt until smooth. Coarsely chop the eggplant, then work it into a somewhat rough puree with the pestle or in a food processor. Add a little lemon juice ot sharpen the flavors, taste for salt, season with pepper, and stir in the herbs. Spread the puree on the toasted bread or crackers, garnish with a basil leaf, and pass around as an appetizer. A limited cupboard can sometimes prove an asset. I had dark red kidney beans from a California market, feta cheese, cilantro, and what seemed like an armload of Redbor kale. They worked well together, much to my surprise. In truth, any variety of kale is fine here, and so is chard and other greens, such as collards. Drain the beans, cover them with plenty of cold water, and bring to a boil. Remove any scum that rises to the surface, then add the herbs, 1 ½ teaspoons salt, and all but ½ cup of the onion. Lower the heat and simmer until tender, about 1 ½ hours. Slice the kale leaves from their stems with a knife. Chop coarsely into 1- or 2-inch pieces and rinse well. Bring a few quarts water to a boil; add salt and the kale. Simmer until tender 5 to 7 minutes, then pour into a colander to drain. Heat the oil in a wide skillet. Add the remaining ½ cup onion and ½ cup of the cilantro. Cook over medium heat until the onion has softened, about 10 minutes, then add the kale and the beans with enough of the cooking liquid so that there’s plenty of sauce. Simmer together for at least 10 minutes, then serve garnished with crumbled feta cheese and the remaining cilantro. Imagine having your own fresh tomato juice. Strained but not cooked, the juice has a consistency far lighter than what comes out of a can. It’s especially fine if you can sip it through the hollow stem of lovage, yet another good reason for having a lovage plant in the garden. Puree the tomatoes and ice in a blender, then pour through a strainer. Add a pinch of salt, some pepper, and lemon juice to taste. Let stand for a few minutes for the air bubbles to dissipate, then pour 2 glasses and serve with the lovage straws or her sprigs. Linda Egenes is a freelance writer who enjoys her local farmers’ market in Fairfield, Iowa.